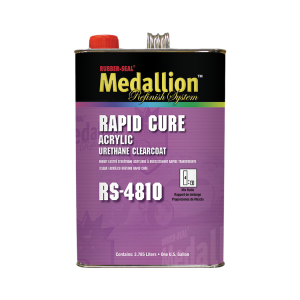 An acrylic urethane clearcoat specifically designed for rapid production environments. RS-4810 can be baked at low temperatures for 10 minutes or air dried 1½ to 2 hours before sanding and buffing. It saves on booth time and energy costs, while significantly increasing shop throughput. RS-4810 is National Rule compliant and mixes 4:1 with RS-4800 series activators (RS-4860 Rapid Cure Activator, RS-4870 Panel Activator, RS-4880 Multi-Panel Activator or RS-4890 Slow Activator). Available in quarts and gallons.